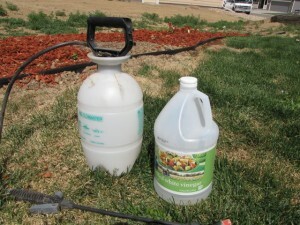 Fill your gallon sprayer or your spray bottle with vinegar and spray away. Don’t dilute it. It will kill the weeds faster than roundup! To use this, only use in areas where you won’t come in contact with plants you want to keep. I use it in my rocks, the driveway cracks, sidewalks, paths and around my shed where there aren’t any plants. Remember vinegar will kill anything it touches so be sure to do this when the wind isn’t blowing. The only time I use “weed killer” is on the nasty asthma weed that grows against the house and in cracks in the concrete. And the only “weed killer” I use is white vinegar, salt or boiling water.